How to deal with torturous toes! Although they’d lain untouched in the wardrobe for over a year, the open-toed sling-backs still looked good. I slipped them on, or tried to. Yeeouch! A pang of pain seared through my small toe. I thumbed the shoe’s leather, hoping to soften it or prod a smidgen more space but that made no difference to my foot’s discomfort. Damn! If I couldn’t wear the shoes, I couldn’t wear the dress for an upcoming party… In fact, none of my high heels would fit comfortably with toes squished tightly into a pointed position. The offending protuberance was tender to touch. As its white central eye maddeningly stared at me, I wondered which this was – a corn or bunion. Feet tend to be taken for granted until soreness of some sort occurs. Verrucas, calluses or fungal infections can unexpectedly take hold and literally stop us in our tracks. I checked the internet for a suggested remedy. Unsightly photos displayed bent toes bedecked with calloused bumps (corns) or knobbly swellings by the big toe’s joint (bunion). I had the corn complaint, it seemed. Nothing serious but the pain persisted. And the party, minus my stylish heels and excuse to don the silky dress (unworn since my son’s First Communion), drew nearer. I consulted my pal for her trusty list of local services. She texted back a chiropodist’s number which I duly rang. “Yes, I can squeeze you in!” the lady brightly assured. This was a new experience for me. The chiropodist sat me on the bench, chatted away and put me at ease while she deftly pared off excess skin and dug out eye of the corn. “The bump is caused by friction or pressure from your footwear,” she explained. “It may reoccur, but now you know how to manage it.” “Will I file your nails and the callused skin on your soles?” she offered. I checked the clock – still plenty of time to collect boys from school. Why not? Lying comfortably with my odorous feet getting the pampering of their lives I was completely chilled out. As she dribbled tea-tree oil on my toes, pumiced and filed off dead skin, my cloven hooves felt fit to expose and nails to be painted. “Your soles should be soft as a baby’s bottom,” she advised. So much for my antediluvian attitude that feet should be tough as nails, ready to walk on hot coals or sharp stones, should the need arise! It’s funny how pain drove me to pleasure. These feet, never getting a moment’s thought, now made me feel like a million dollars. Back home, I nabbed daughter’s nail varnish and treated myself to hot pink talons. They don’t quite match the heels or dress but who cares? A low maintenance gal who hasn’t indulged in the mani-pedi, it’s a new me. I’d better get the hairy legs waxed, though, before I dare to wear those peep-toes! 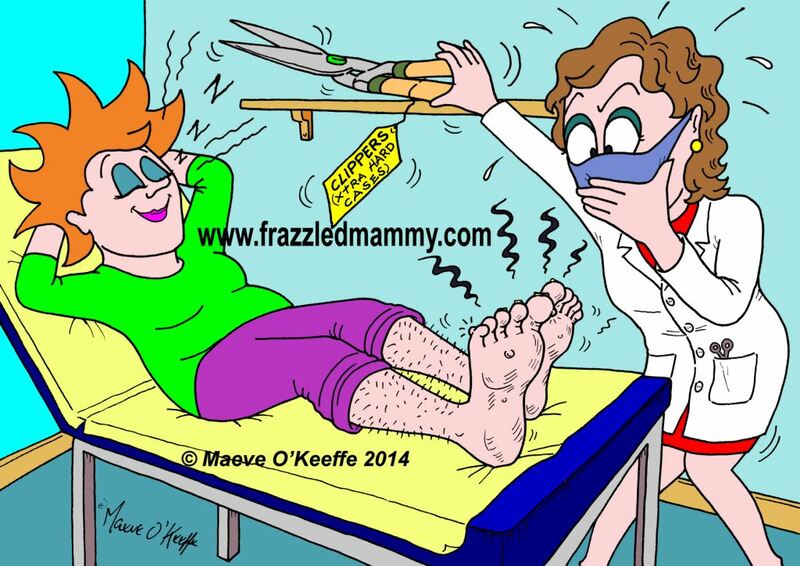 This entry was posted in Parenthood and tagged Cartoonist, Cork, Illustrator, Ireland, Maeve O'Keeffe, Mother, Parent on July 24, 2014 by frazzledmammy.